I’ve been thinking about that phrase this morning. It’s a goofy phrase, easy to dismiss as typical Jobs hyperbole. I’ve decided it’s quite a precise phrase, though. At Apple, at NeXT, at Pixar, Steve Jobs was by most accounts incredibly difficult to work for, but in a way that made people want to make products that met what were, compared to those of typical corporate leaders, insanely perfectionist standards. That drive to achieve his vision, to drive everyone to make whatever it was better, to make it better than they could even imagine, resulted in some insanely great products—”cartoons” that are great films, phones and computers that remain pleasures to use long after their novelty wears off (if it ever does). One could wish, hoping for a better world, that exacting drive on more executives in all fields, except that in those without a focused and inspiring vision like that of Steve Jobs, we wouldn’t get insanely great—we’d just end up with a bunch of megalomaniac martinets who were merely insane. “Insanely great” is not an easy standard to pull off, and Steve Jobs did it routinely. I suppose I could be called an early adopter, at least for the early years of personal computing, but I don’t really consider myself one, because I bought my first computer used from my brother in 1978, when he upgraded to a TRS-80 from his funny little Commodore PET. Actually, the PET wasn’t so little, physically, at least. 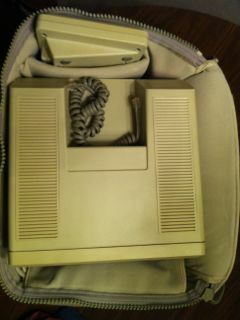 It was larger than a typewriter, a large angular metal case with a teensy calculator-style “Chiclet” keyboard and a small monochrome CRT. It ran on the MOS 6502 processor, had 8K of memory, and data storage was on magnetic tape via the built-in cassette recorder. The PET taught me fatalism: I would spend an hour or two painstakingly typing in a BASIC program and then hold my breath when I told it to “Save” and waited several minutes while the cassette recorded to see if this time I’d get to see the program work instead of the error message that told me I had to start all over from the beginning. (The poor thing couldn’t handle incremental saves.) If I was lucky, I’d get to see my program run; more likely, it would start and then run into a typo, which I’d have to find and avoid reproducing the next time I typed the program in. After a few months of this, I upgraded to an Atari 800, which had a real keyboard, real RAM, and hooked up to my color TV. 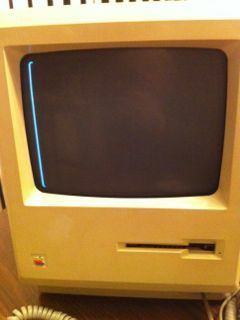 It was even capable of word processing, though in that funny non-proportional dot-matrix font without ascenders or descenders that was common on computers back then. This was a much more fun toy—there were games like Pong and Space Invaders and eventually Centipede, and there was enough memory (48K) to do slightly more complex programming (though I have no memory at all of any of the programs I wrote). A few months after I got the Atari, I started working at the flagship store of a local department store chain as the manager of their new (and all shiny black with red neon) personal computer department. We carried the Mattel video game system (which we didn’t sell many of—it was pretty dated by then, and not that good to start with), the Atari 400 and 800 (along with their spiffy printer, which had two on/off switches because they thought the local/online switch would confuse consumers too much), and, of course, the Apple II. I wasn’t particularly impressed with the Apple II; the Apple IIe that was released after my first Christmas at the store seemed a big improvement, though I still wasn’t tempted to replace my Atari. He was right, of course. 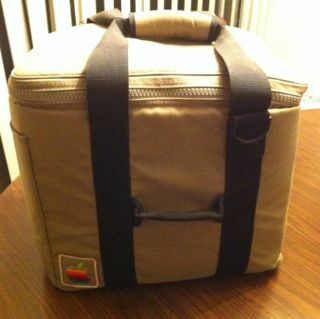 In early January 1984, I drove down to San Francisco with my counterpart from our Fresno store, and met the chain’s electronic buyer at the Hyatt Regency for the big dealer announcement of the mysterious new Apple computer. After we signed our non-disclosure agreements, we were given information packets, with pictures and descriptions of the new Macintosh, which would be released within a few weeks. Several hundred of us sat in the huge ballroom, where songs from Thriller blared, and eventually we got an interesting—though not terribly exciting—slide presentation, along with the famous ad that would be shown during the SuperBowl. Unfortunately, Steve Jobs did the presentation at the East Coast gathering—we on the West Coast got John Sculley. After the slideshow, though, things changed completely. 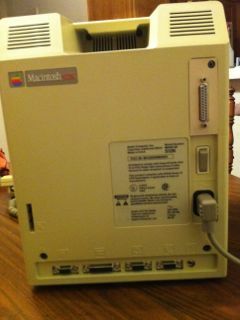 After the slideshow came the hands-on breakout sessions, and as we walked into the classroom we each made a weird little “ooh” sound—the Macintosh was smaller than we’d expected. It was weirdly cute. And it was amazing. It had those real typefaces, black on white, and was incredibly easy to use. We got to play with MacPaint, the drawing program unlike anything seen before on what were then still called microcomputers, and learned to cut and paste text in MacWrite, which seemed almost magical, reminding of the years in grade school when I’d wished for a machine that would make writing error-free essays easier than my penmanship did. Later that day, we learned about what they called the Own-A-Mac program. On the theory that sales people who knew how to use their computers would be better at selling them, Apple offered us the opportunity to buy the $2495 Macintosh, its $595 printer, and a carrying bag for $1055. Not only that, but participants would be enrolled in a program which allowed us to purchase software at steep discounts (a minimum of 60%, as I recall) from manufactures like Microsoft, Lotus, Electronic Arts, and many others. I bought one, of course, just like Steve Palmer had told me I would, and I’ve been upgrading ever since, to the point that I’ve lost track of how many Macs we’ve had. They’ve not all been magical machines like that first one, the kind of gadget that is simply satisfying to use. Some were merely okay, but an astonishing number from the years after Steve Jobs returned to Apple simply made me happy to work with—clearly I was in the demographic his design sense targeted. My Pismo PowerBook, and my little aluminum 12″ were among my favorites, at least until my current PowerBook Pro/iPad/iPhone gadget combo. It’s silly, but I often use all three devices at once—working on a document on my laptop while I refer to a pdf on the iPad and use the calculator on my iPhone. I can use Windows machines, too, of course, but I have to think about them too much to be happy using them. Despite my early adopter years playing with the PET and the Atari, I’m into computers not for the geek, but for what I can do with them—write and edit and calculate—and Steve Jobs’ machines suit the way I work better than any other tools I’ve ever used. The bag seemed so cool, but I don't think I ever used it more than once or twice. Pocket for the keyboard, pocket for the cables (and the external drive, which I don't have any longer), and a pocket on the inside of the bag top for the mouse. I'd completely forgotten you used to have to screw cables in to attach them securely. That keyboard was one of the nicest I ever used—at the time. Tonight it felt heavy and clunky. And I'm so much a trackpad person these days, I almost forgot to plug the mouse in. So, all set up and plugged in, and I can’t even remember clearly what the start-up screen is supposed to look like. 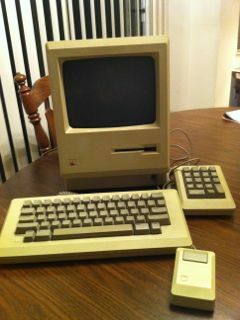 I upgraded this machine with more memory and a faster processor, so it’s functionally equivalent to a MacPlus. Oh, well. It's eight months older than my older daughter, and she just turned 27. But that’s okay—I’m happy with what I can do with my current crop of Apple devices. I hope Apple will be able to keep it up for a couple more decades, too. 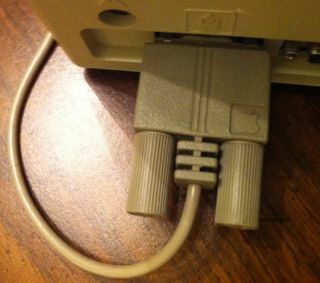 But one of these days, I think maybe I’ll dig up a Torx driver so I can open the old Mac up and see the names molded on the inside. As much as that crew believed they did something amazing, they had no idea what they started. 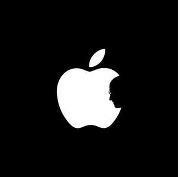 Without Steve Jobs, it would never have happened.